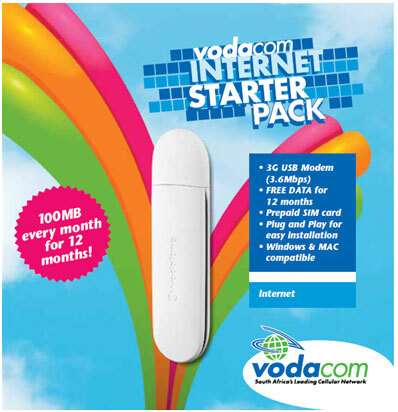 Following on from CellC’s Mobile Broadband offering, Vodacom earlier today launched a new product called the “Internet Starter Pack“. The package is a pre-paid package, which means there are no nasty monthly contracts, and you can also “top-up” your sim card using Vodacom Vouchers if you run out of data. This is a fantastic deal, and I think is going to be very popular, especially amongst internet users who don’t need an ADSL, but still need something to check emails, and do the odd Google search. I would buy this just for the 3G modem. I can’t understand why providers even offer these 100 or 250MB options, what must one do with that? I’ll stick to the Cell C deal thanks. Got to agree, maybe for my gran who cant afford ADSL and is still on dialup, but otherwise Vodacom what are you thinking ? Are you trying to go bankrupt, cant wait to change to Cell C, when I get their HSDPA coverage, then my Vodacom ripoff bundles will come to a well deserved end. Yeah. I did not do enough research on this. I sadly bought one yesterday. I was on the net for a full 4 minutes and my 100mb was sadly used up. Now I’ve got to pay R28 for 30MB which will obviously last me a whole Minute or so…. I wonder if I can just use the modem, but insert my Cell C Simcard in it… Anyone know? Sorry to hear that you made the same mistake. It’s not a nice feeling when you spend your hard earned money on something you think will be great, only to find it is useless. Best is to try subscribe for uncapped ADSL. Take care. Hopefully our lessons learned will help others choose more wisely!